Franz Eckerle was born on 24 April 1912 at Baden-Baden. He learned to fly gliders and engine-powered aircraft and joined the still secret Luftwaffe. In 1936 he attended the Jagdfliegerschule at Schliessheim. In 1938 he placed fourth in the German aerobatics championship and in 1939, second. At the outbreak of World War 2, Eckerle was Staffelkapitän of 3./JG 76. He participated in the invasion of Poland but had to wait until the French campaign to confirm his first victory, when he shot down a RAF Spitfire fighter on 15 May 1940. 3./JG 76 was redesignated 6./JG 54 on 4 July. The unit became a fighter-bomber unit for the Battle of Britain but Eckerle still managed to record three additional aerial victories. Eckerle led 6./JG 54 in the invasion of Russia. On 30 June 1941, he claimed three Russian DB-3 twin-engine bombers shot down on two missions to record his sixth through eighth victories. In July, Eckerle claimed 14 victories, including three Russian SB-3 twin-engine bombers shot down on 2 July (9-11) and two Russian I-16 fighters shot down on 23 July (20-21). Hauptmann Eckerle was awarded the Ritterkreuz on 18 September 1941 for 30 victories. He recorded three victories on 1 January 1942, when he shot down two Russian I-16 fighters on a morning mission from Kragnogvardeisk and a Russian I-153 biplane fighter on an early afternoon mission. On 20 December 1941, Eckerle was appointed Gruppenkommandeur of I./JG 54. 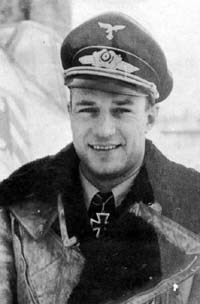 Eckerle recorded his 60th, and last, victory near Voronovo, near Velikiye Luki in aerial combat with Russian I-15bis biplane fighters on 14 February 1942, but his Bf 109 F-2 (W.Nr. 9728) “CH + OP” was also hit in this engagement. He baled out, unhurt, behind enemy lines but remains missing to this day. Reports from prisoners of war indicate Eckerle may have been killed by Russian troops. Eckerle was posthumously awarded the Eichenlaub (Nr 82) on 12 March. Franz Eckerle was credited with 60 victories. He recorded 56 victories over the Eastern front.